Please leave a message using the comments field below. I have to be honest I had never heard of Neil until I learnt of his tragic death on YouTube – he was obviously a great talent. The bottom line is this – Here in 2011, were Neil still racing, then ALL of us would have heard of him! very true Mike! He was an incredible talent, and would’ve gone far. thank you for your kind words. Hey, mate, thinking of the good times! I hope the passing of time has eased your burden. The high regard with which Neil was helds still very much alive today. Best wishes to all your family for the future. Great tribute site to Neil. Myself and Mick M often talk about him and the good memories! Will never forget i was stuck for a kart before an important race and i called him to ask could i rent one of his old ones as he had moved on to Formula Ford, he said “you can’t rent it but you can borrow it” that was the kind of guy he was! He lives on and won’t be forgotten. Miss you each and every day buddy.. I didn’t know Neil, but if it’s any consolation to his parents and family, his short life was enjoyed to the full, supported by family and friends. Neil “lived” the dream of many young boys. A very small precentage of young sports stars, in many sports, unfortunately become victims of accidental or natural incidents that bring their adrenaline filled lives to a premature end. We would not have the enjoyment of motorsport without the brave enthusiastic drivers of all ages. Sending all our love from Canada to you. Not a day goes by where you are not missed. You were an incredible driver and loved by many. RIP Neil! Mate, still wish I was reporting on you! Except we’d both be on top of the world by now…. Great memories of Neil sure hes still winning in the heavens. Every day I see Neil’s photograph in its place upon my mantelpiece and I look into Neil’s eyes and find great comfort and love and know that he watches over us all from his drivers seat in Heaven. A workmate suggested a night out Go-karting recently and it brought back lots of memories from our time in the Karts belting round Watergrasshill and Kilcornan. Missing those days and the innocence of it all. Hope you are resting in peace Neil. What a lovely tribute site to a promising talent. I didn’t know Neil, his family or friends but I would like to pass on my thoughts and wish you the best for the future. The website and its content will certainly ensure Neil’s memory lives on. You’re never out of my mind. You were a very special person in all our lives . We will never forget you. May you rest in peace. Mary,Liam and Clare we are all thinking of you today. Where has the last 17 years gone it just feels like yesterday and after all these years we are all as close to Neil now as we ever were . Neil will never be forgotten he lives in my mind every day and the great thing is his achievements are still spoken about. We had so many great days together with Neil and his great family in such a short time that these memories are what keeps us all going . Neil i am sure your looking down on us all Today . Your mentor your friend and your second family. Mick,Anne Catherine and Fiona Merrigan. 17 years today and still have great memories of our time racing together, be it in Karts or as team mates back in the good old days. Memories that I will cherish buddy. In 1997 and 1998 Neil won the Sexton Trophy and I will always remember meeting Neil and thinking this guy has something special. To Neil’s family and many friends I can only offer my deepest sympathy. Thinking of Neil in this moment and all the good times back in school. NEIL SHANAHAN lives through the TROPHY awarded to the courageous Drivers who emulate his achievements. Well, Neil. Time’s passed but you’re always around for those who had the pleasure of your company. Your colleagues and rivals from FFord are now mostly racing kids half their age… but they’ve got a few trophies between them. I know you’d have added plenty more. As you liked to point out, you’ll be glad to know that my haircuts are still rubbish… so not all that different. Thinking of you and your family. God bless. Another year on ,you will never leave our hearts or minds may you rest in peace. Is a great tribute, to a young man that put a smile on everyones face that ever knew him. It is like he is still their each time you look at the page. it is hard to believe that 18 years have gone. 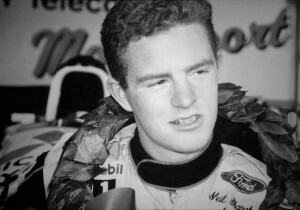 On this anniversary day it’s hard to think 19 years have passed and your death is still so fresh in my mind . I was looking at your web site last night and watching you driving your Race cars and you still make me jump up and Cher you were Pure magic . I / we will never forget you ,Your always in my prayers every day . Thank you so much for all the great times we all had together. May you rest in peace my dear beloved Friend. You brought so much happiness and pride to my dad and our family. You were a true champion. Thank you for all the wonderful memories. Watch over Dad and us all from your pole position in heaven. Thinking of your Mam, Dad and Clare today and not forgetting baby Neil.